Seattle is known for it's rain and we have had plenty this spring! 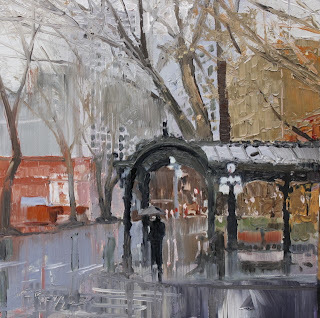 I love to be in the city when it is pouring down rain! All the reflections and umbrellas come out . Nature does the job of softening edges and muting colors that makes for great painting. I have completed a small series of rainy day studies featuring the famous Seattle Pergola in the heart of Pioneer Square. The elaborate Iron Pergola was erected in 1909 as a stop for the Yesler and James Street Cable Car Company. This waiting shelter was the most lavish of its kind west of the Mississippi with ornamental iron columns, wrought iron ornamentation and a large underground restroom. The pergola was designed by Seattle architect Julian Everett. Here is another Pergola painting from the archive which received a lot of attention. Maury and I hang out in the city every time we get the chance.....which is fairly often. I'm usually over a couple times a month..Sometimes we find a spot to sit and sketch , other times we walk around taking pictures of everything like tourists.... hoping for a photo that will yield elements that we can use in a composition for painting. This time we were headed for the Five Point Cafe.....our newest favorite place to eat lunch. This scene has two classic Seattle monuments, The Space Needle and the Monorail, which leads from Westlake to Seattle Center. 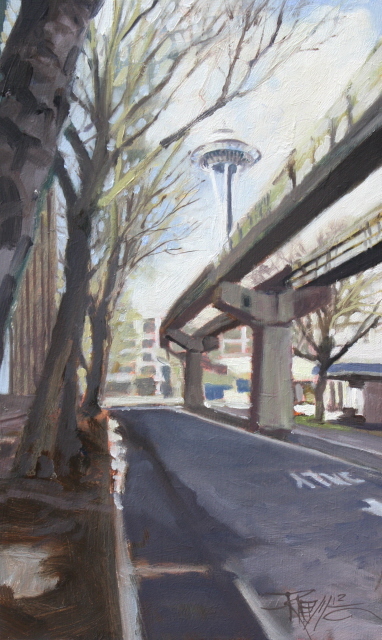 This is my first painting of the Monorail, but I have painted the Space Needle many times . 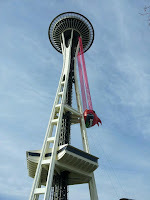 You can see my painting of the most well known view of this iconic symbol of Seattle here. The Space Needle was built for the 1962 Worlds Fair.It has 25 lightning rods. It is built to withstand winds of up to 200miles an hour and earthquakes up to 9.1 magnitude. The earthquake stability of the Space Needle was ensured when a hole was dug 30 feet deep and 120 feet across, and 467 concrete trucks took one full day to fill it. The foundation weighs 5850 tons, including 250 tons of reinforcing steel. With this concrete base weighing the same as the above-ground structure, the Needle's center of gravity is just 5 feet above ground level. The structure is bolted to the foundation with 72 bolts, each one 30 feet long. 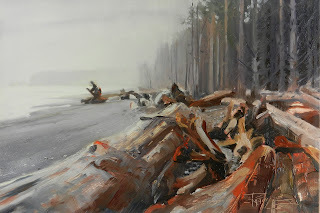 It has been a cold wet spring here in the Pacific Northwest....as per usual!! But every once in a while we get a few hours of decent weather....I took the opportunity to sneak out to the power line rd....which is right across the street from the studio. You can see a new element to the plein air rig....I have bungeed my back-pack to a hand truck. which helps a lot when I don't have to hike into a remote location....I'm hoping to be able to use this at Red Rocks.... Wow! ....and that's coming up pretty soon! 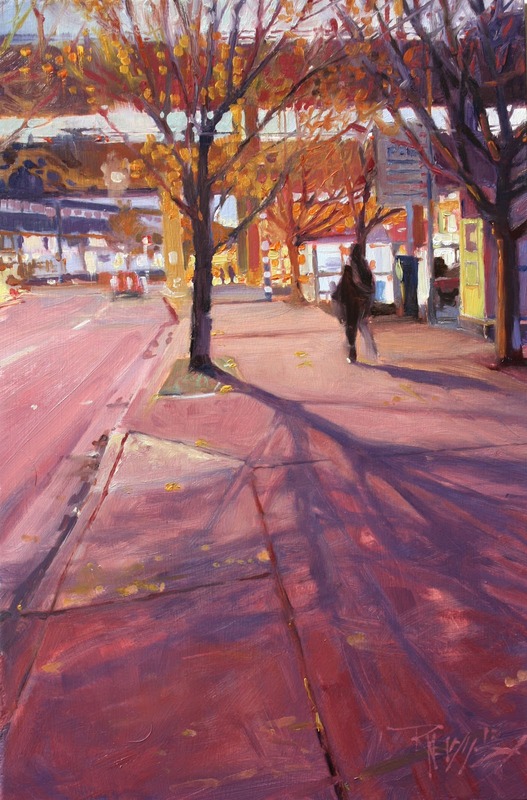 I'm back to painting city scenes for our upcoming show at Alki Arts in June. My son Maury and I will be collaborating in this father and son show to celebrate Fathers Day. 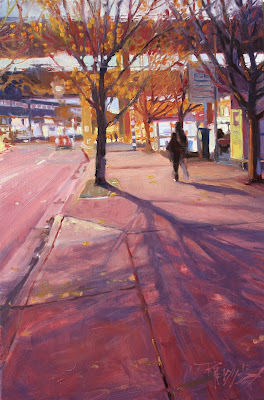 Maury has graduated from the Art Institute of Seattle and is mostly working digital...(You can see his work here). However he has agreed to join me in this exhibition with some traditional artwork.. It is always great meeting like minded artists. Last week I went over to meet a friend I met on Facebook who also enjoys painting city scenes of Seattle. 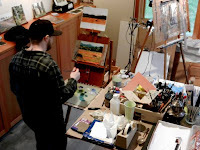 Having the background of architectural illustration he's good at it too! 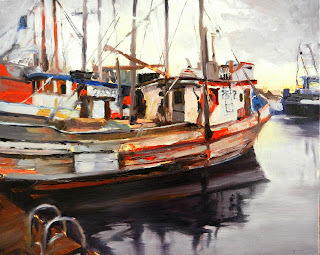 William hook is spending his free time these days doing fine art paintings of Seattle and environs in watercolor. You can see his excellent work here. Thanks for giving me the tour of your working space Bill! By the way, if you have been linked to my site before and are wondering why you're not any more it is because I lost all my links when I updated to the new template. I am slowly adding most of the links back as I remember them. Feel free to give me a shout if you would like a link. On the way back from the ocean there is a long drive around Crescent Lake. There are many beautiful scenes as you bank the turns following the shore line. What always catches me veering into the opposite lane as I crane my neck around to look are these magical little waterfalls, especially in the winter, that cascade down to the lake. I had to pull over and capture this one. I tried my best to simplify and create a mood here .......Over-worked? 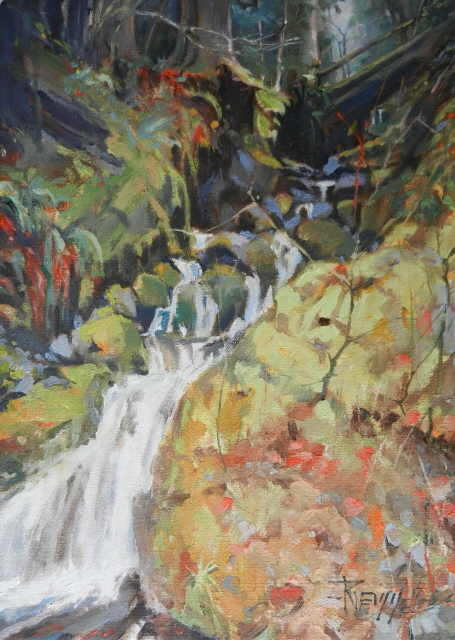 I have completed about six or seven waterfall paintings. You can see the one I think was the best here.....and it is in the middle of Seattle! I was interested by the trees coming down to the oceans edge... They remind me of a scene from some fantasy movie. I can picture Sam and Frodo making their way through a forest like this, evading some unseen danger. It was also quite an exercise in perspective drawing. Not only with line but with atmosphere. Another painter who does a great job painting distance with atmosphere is Marc Hansen. You can see his work here. 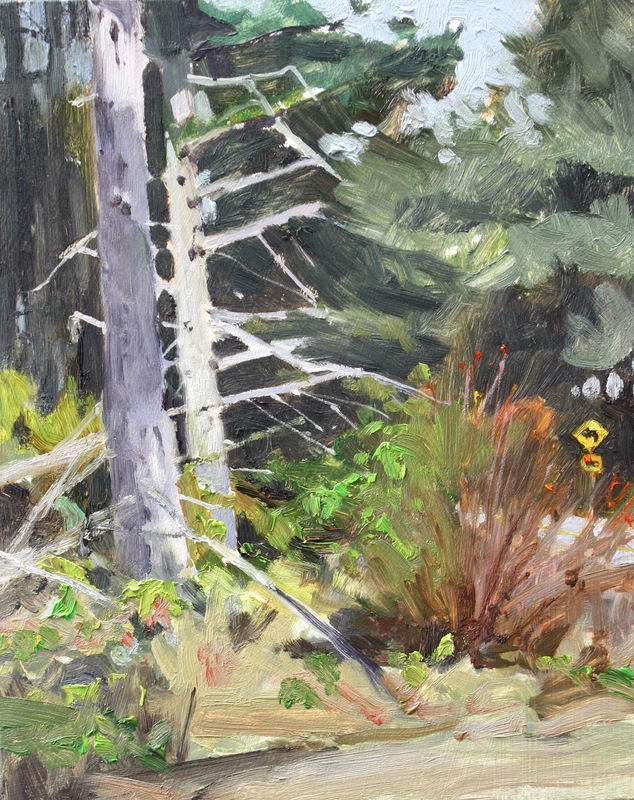 If you would like to take a trip down blogger-memory lane, you can click here to see some sketches of a trip I made to La Push in 2008. 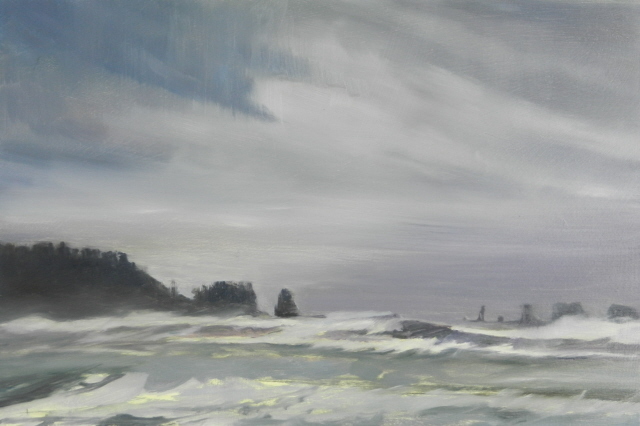 Back to my series of ocean scenes from La Push, Washington. This was done from a photograph taken on location. 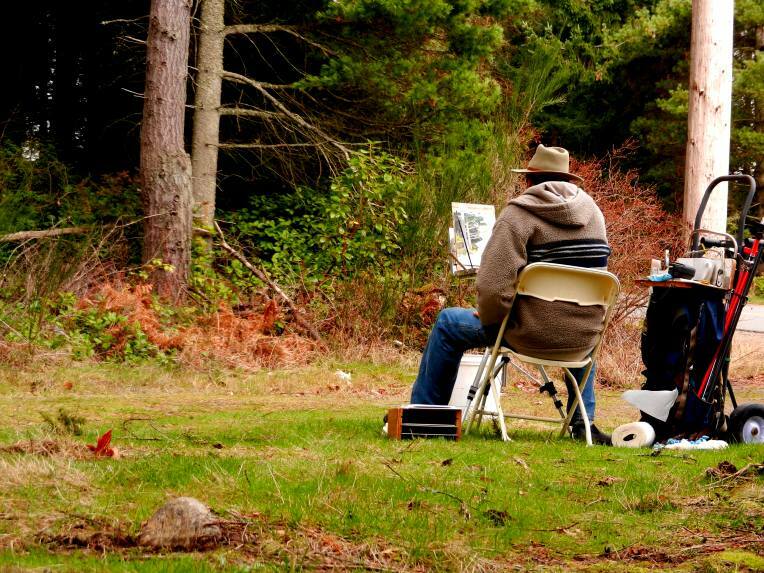 I have tried to paint in conditions like this and it is no fun. You end up getting more sand on your canvas than paint! I did try and limit my time for execution which gives it a little more of a PA feeling....I hope..This view of James Island is from Rialto beach. All things must change.....Right! But man it is hard for me to change old habits and ingrained routines!...I have had my old blogger template since 2006!...virtually everyone has updated their blogger formats but me....Keeping things fresh is crucial in this business .....so after getting fed up with the problems I have been encountering with my old blogger interface I finally updated to a new one...Let me know what you think? I really want to be open to change and keeping things fresh with my artwork too..I think one of the keys to that will be to get out in the field more this year. 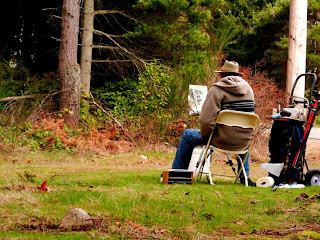 I have a couple workshop trips planned starting with the First Annual Plein Air Convention and Expo in April. I am also looking forward to joining my friend and fellow painter Darrell Anderson in Montana for the Bitterroot Workshop later in the fall. Until then I will be getting out between commissions.. 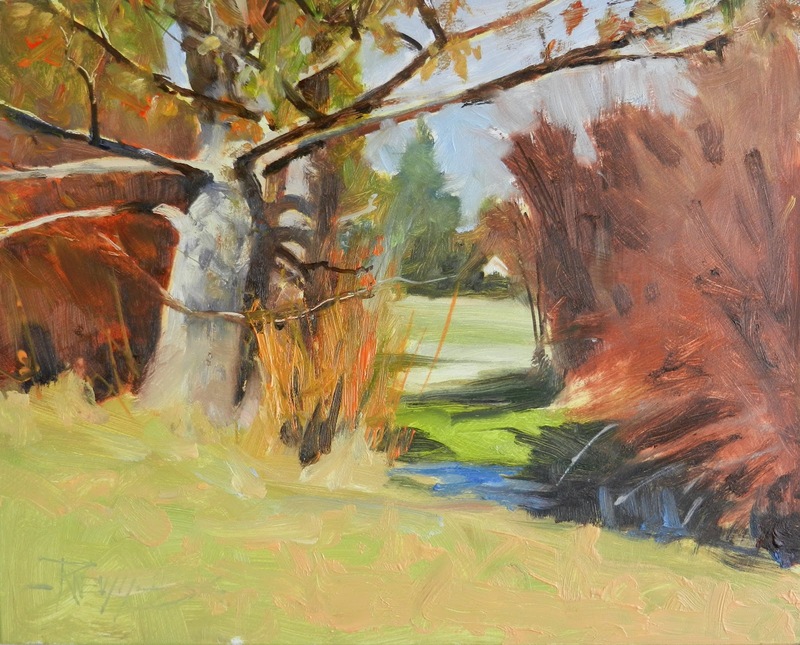 These pines are out in the field by the studio....Unfortunately they are dying ...So I wanted to paint them before they are removed. My pallet consists of Ultramarine blue, Cad Red, Hansa Yellow and Titanium White. On another note...so to speak....If you live in our area and have never been to the Knowles Studio where I work...Saturday night would be a good time to do that! Jazz Canvas is a special event at the studio. A core group of jazz musicians play with a special guest artist while my colleague, Leigh Metteer interprets the music on canvas...At the end of the show the painting is raffled off...It is a fun night you won't want to miss....especially since Kyle Gregory is back with us again from Verona Italy!